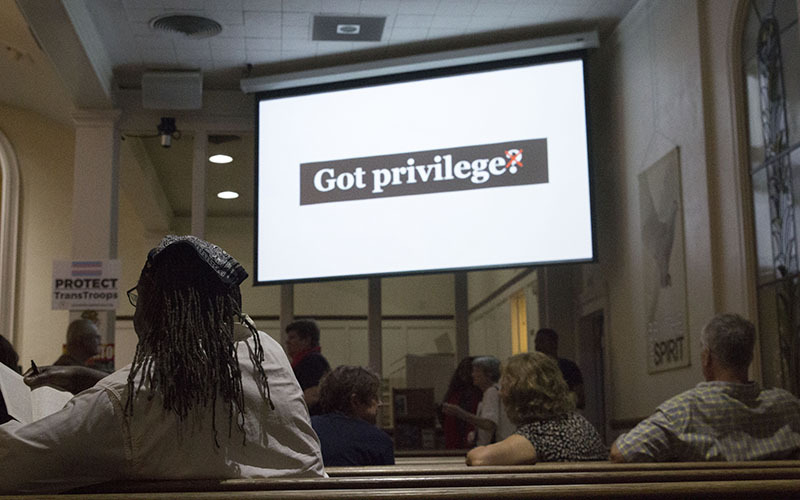 PHOENIX – To community members and Valley residents who gathered at First Church UCC to discuss ‘white privilege,’ the topic is no black and white matter. While some in the room were more than willing to speak openly, others seemed more cautious to share and participate, but as the night went on, the conversations started to flow. The topic of conversation? White privilege. 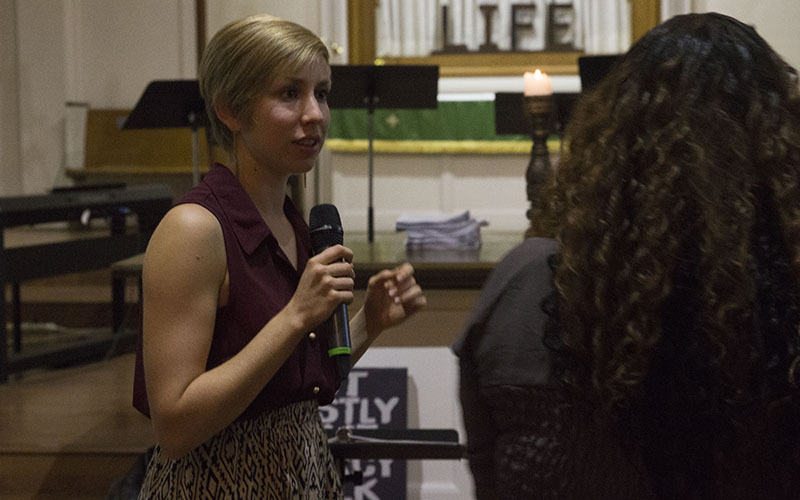 Thursday was the first of five-to-six sessions held in Phoenix’s First Church UCC, bringing a subject to the table that makes many people uncomfortable to talk about. The conversation was led by Senior Pastor James Pennington and community activist Allyson Yoder. As she arrived, insurance salesperson Tiffany Kanehl shared she had come to the event with no expectations. “I would imagine that there will be some tension in the room, but I’m just here to keep my mind open, learn and observe,” she said. Kanehl, a white mother of three, was hoping that she could walk away from the event with a better knowledge of how to handle having a multicultural family. Sitting in the pews was also Jacque Starks, a consultant who has been involved in events addressing similar topics. Starks said she hopes to build connections at the event to bring the White Privilege Conference to Phoenix in 2020. Pennington and Yoder started by addressing the audience. “We want to assure you that we are not the experts, and that we just somehow have kind of fallen into this work around our own passions. This is a passion very clearly for Allyson, and it’s been a passion for me,” said Pennington. Allyson Yoder, who co-facilitated the event, speaks to an attendee. (Photo by Lysandra Marquez/Cronkite News). Participants were asked to signal with hand gestures when they agreed or disagreed with statements, and then were invited to share their experiences in dealing with privilege. The room was full of people of all ages and backgrounds, sharing what it was like growing up witnessing segregation and racism. “I grew up in a tiny town in the Midwest, that was all white, and I didn’t know this until later, when my parents explained that a black person could not stay overnight in our town. I didn’t really know any black people and I had never seen any black people while I lived there,” said one participant. Among those who also spoke up was Native American activist Shannon Rivers, who addressed that white privilege extends beyond white or black people. “It seems that when we talk about race, we forget about the first population, and that is the indigenous peoples. I hear black, white constantly talking, but the erasure of indigenous peoples is so common amongst you,” he said. “This is my land, let’s be clear. We never gave the land up, ever. It doesn’t mean that I’m being angry or aggressive to you, I’m speaking truth in reality,” Rivers said. Soon, those who came out were broken off into smaller groups for 20 minutes, where they discussed in detail their personal experiences with white privilege. Pennington and Yoder shared that white privilege is a timely and important issue to address. “Opening the conversation up about white privilege, it’s critical now. It should have happened eons ago, but I think the underbelly of the racism in our country has just really been exposed through this election, and through our current administration in ways that it hasn’t been exposed before,” Pennington said. “I think that people of color have been naming [white privilege] forever in this country, and now we’re kind of in a moment, with the election of Trump where white people are feeling like — and I’m speaking for myself here — but [we] have to do something,” said Yoder. With bowed heads, both Yoder and Pennington ended the night with a prayer. Redeem Robinson said that he had never seen an event like this go on in his community. “You know, I thought I was going to walk into some hostility. I thought people would be a little thin-skinned, and I didn’t get that tonight. I think that people were very receptive,” he said. Robinson, who is African-American and a Phoenix resident, is running for state senate next year.